By Alan Green in VectorVest on 1st August 2018 . FTSE 250 company Great Portland Estates (GPOR.L) is a property investment and development group owning £2.8bn of real estate in central London. The group proactively manages its portfolio, flexing activities in tune with London’s property cycle to deliver long-term out-performance. GPOR creates in-demand spaces that people want to be part of; helping occupiers, local communities and the city to thrive. Toward the end of May 2018, London property group GPOR flagged up as an opportunity for VectorVest members in the form of a Relative Value (RV) flag. 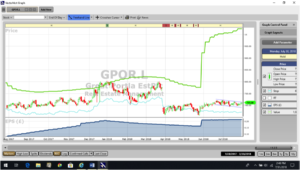 Since moving above 1, the RV, an indicator of long-term price appreciation potential, has continued to climb, and today logs GPOR at 1.51, excellent on a scale of 0.0 – 2.0. Added to this the company logs a GRT (Earnings Growth Rate) of 32%, which also rates as excellent on the VectorVest stock and portfolio management system. Trading today at 711p, GPOR still offers plenty of upside against a current VectorVest valuation of 1,024p. 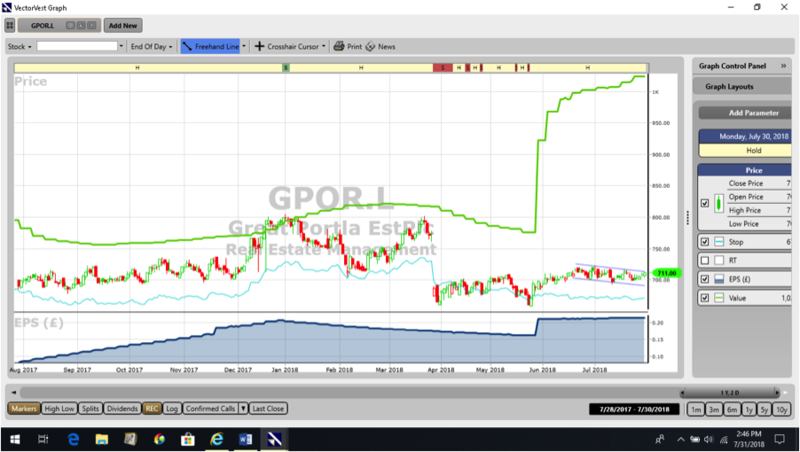 A daily candlestick chart of GPOR.L is shown above. The green line above the price shows the revaluation of the company as earnings per share rose during June 2018. The revaluation is a strong leading indicator of a move in the share price. At present the share is charting a “flag” pattern and a break above the trendline defining the pattern plus a VectorVest Buy signal should precede a strong upward move.